When motorized, our Wavewalk® 500 kayak and Wavewalk® 700 car-top boat are heavier, and they go at high speed. This may require adding high capacity, multi-purpose flotation, which is what Wavewalk’s inflatable detachable flotation modules offer. 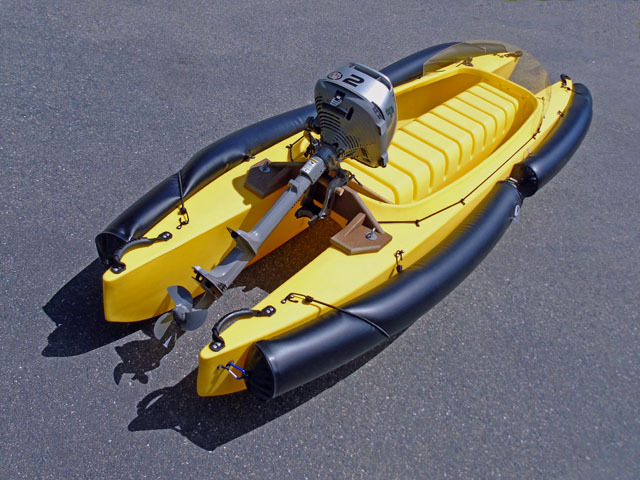 When attached to the kayak’s sides, the inflatable flotation tubes can make it less easy to paddle, which is why these accessories are mainly a solution for motorizing and not for paddling long distances, unless you attach them under the kayak’s saddle, where they won’t interfere with the movement of your paddle. 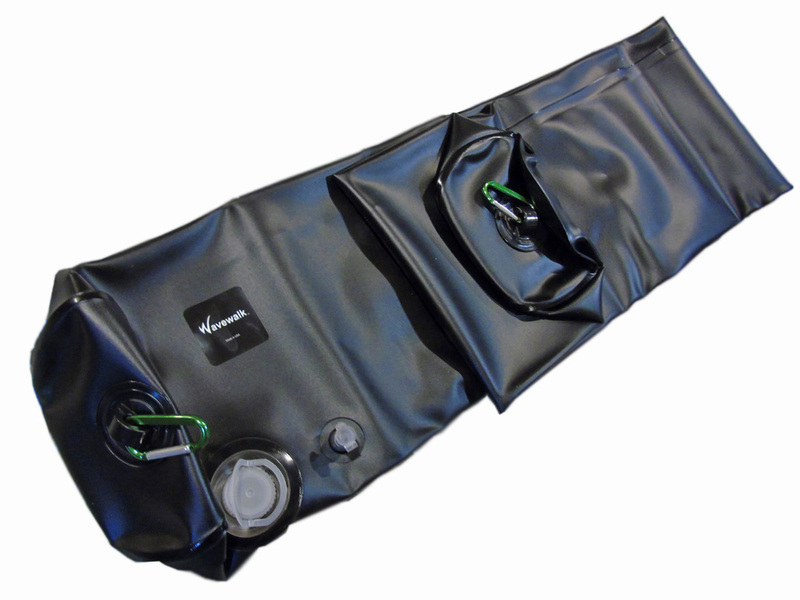 Wavewalk’s multi-purpose, detachable, inflatable flotation tube (folded). Note the two inflation valves, and the carabiners on both ends, for easy and quick attachment. –Note: Fits exactly between the eyelets on the kayak’s sides in the XL and INF configurations. -Note: Each side of the Wavewalk TM kayak can fit up to 2 inflatable flotation modules (Maximum 4 modules for the kayak’s sides). Volume: The volume of a single inflatable module is 2,000 cubic inches (8.65 gallon / 32.5 liter). The volume of a pair is 4,000 cubic inches. Air valves: Each module is outfitted with 2 air valves – A 1″ wide easy-filling valve, and a small valve for quick pressure-release. –Note: The wide air filling valve eliminates the need for an air pump. –Note: Do not fill the flotation module completely – Always leave some room for the air inside to expand as the sun warms it. If you see the surface is too stretched, release some air through the small valve. Price: This accessory is sold in pairs. Each pair sells for $230. Shipping: When ordered together with a W kayak, these accessories ship with no additional cost. When ordered separately, S&H is $30 to addresses in the continental US, and $40 for shipping to addresses in Canada and Alaska. Trimming at high speed: When the inflatable flotation tubes are attached on both sides on the kayak’s stern, the added buoyancy there helps in keeping the kayak level when motorizing at high speed, both in the front-back and left-right directions. Outriggers (Stabilizers): When attached on the kayak’s sides, the flotation modules act as outriggers, namely increase its lateral stability. This is particularly useful in the motorized or sailing modes. Capsize prevention: When attached to the kayak’s sides, the inflatable flotation modules help prevent it from flipping in case of an accident. Recovery (flotation): In case an accident happened, the flotation helps the kayak stay afloat. 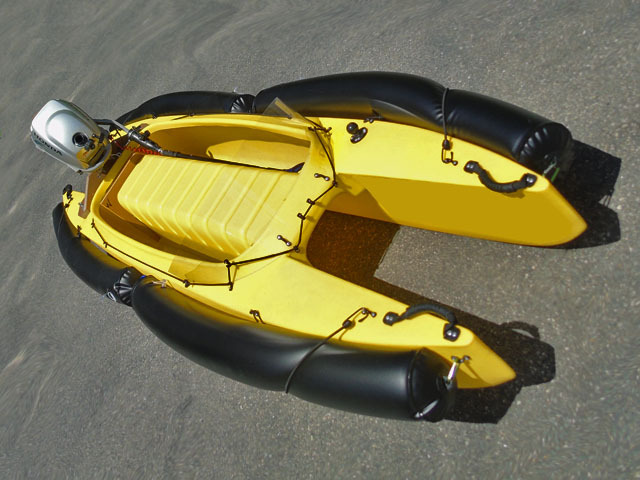 Recovery (flipping back): In case the kayak is overturned or laying in its side, the inflatable flotation tube can help the user flip the kayak back. Personal flotation: When detached from the kayak, an inflatable tube can serve as personal flotation. So you’re stepping out of the kayak box? It’s still a W kayak, but this inflatable flotation adds a new dimension in terms of performance when motorized. 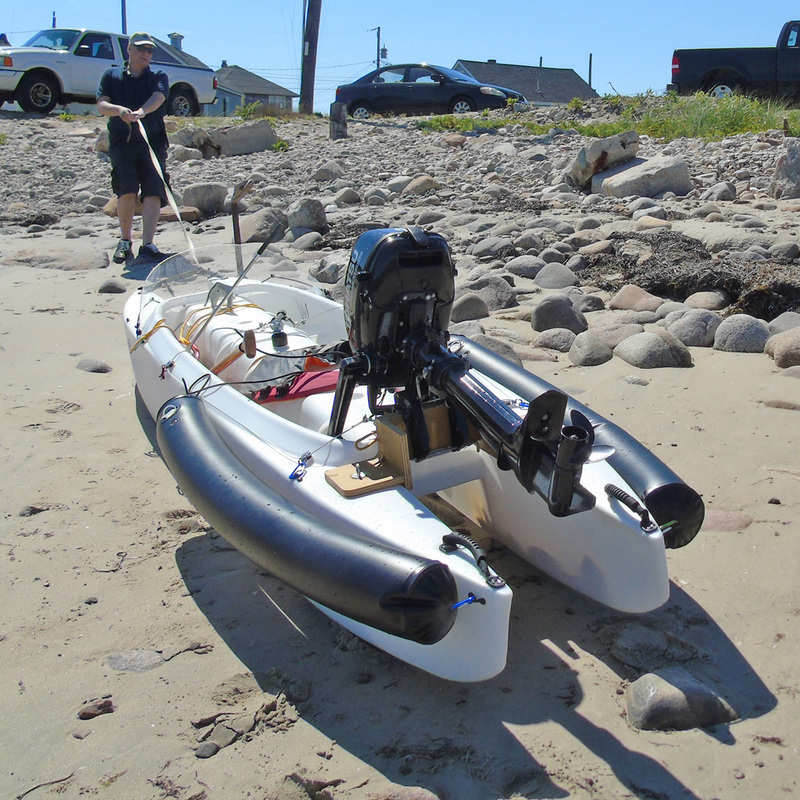 In fact, joining the floats’ front ends behind the user and attaching them in this position instead of attaching them on the kayak’s sides offers the user to paddle their kayak with hardly any problem. I would have liked to offer it at a lower price point, but we can’t because it’s custom made in the US, which means our initial cost is high. Having said that, if you look at other inflatable flotation for kayaks and canoes, you’ll find that our price isn’t off the range, at least in the high quality category. This is a good solution to a particular problem that One-Shot Kenny Tracy solved by outfitting his w kayak on steroids with stryrofoam blocks. With a 6 HP outboard and going at 13 MPH, and possibly even faster, he had to boost flotation, but how many people are going to outfit their w boat with such a beast? What’s the point in overpowering your fishing boat by so much? We surely don’t recommend overpowering the Wavewalk 500, or any other boat, because it’s dangerous to do so, and outfitting such a tiny and lightweight craft with a 6 hp outboard motor is overpowering it – no doubt about it. The purpose of these new accessories is not to encourage people to overpower their W500, it’s just to offer another type of flotation solution that’s more effective, as required in non-paddling applications such as high speed motorizing and sailing with a big and powerful rig. Not that I would consider these for paddling / fishing applications, but I’m wondering if one would have value placed underneath the saddle for flotation purposes in an emergency situation. If it’s diameter was narrow enough so as not to touch the water and interfere with paddling, it might provide more floatation than noodles placed underneath the saddle or around the rim. I’m guessing it’s too wide, however. Ha! I would have never imagined a W looking like this! Okay so it’s got the looks of a swift boat… and it’s not sluggish to say the least. But what about fishing?? What’s one to do about their fishhooks flying all over the place?… I’m not trying to be a party pooper, but isn’t fishing the main thing that people do with this kayak / boat / dinghy / skiff or whatever you want to call it? How do those inflatable floats fit in? The answer is that a motorized W kayak is safer, since its hull is made from rigid Polyethylene, and it’s also a more comfortable ride. On top of this, you can easily remove the front floats, deflate them in a minute, and store them in the storage area behind you. This leaves you with a good range of motion for fishing, especially if you fold the rear pair of floats behind you (takes about 30 seconds). It’s not always possible to remove the front pair when you’re on the water, but when it is, it’s also easy and quick. When the rear floats are folded behind you, it’s even possible to paddle the W500 almost normally. In sum, you get all the advantages of a fast and portable motorboat combined with those of a stable and comfortable paddle powered W kayak. After some additional thought, it should be possible to position those two front floats and remove them from the front to a temporary storage position in the back by means of a rope or a cable. What I have in mind is similar to an anchor trolley that many yak anglers use. It shouldn’t be a big problem to figure such a system for the front floats. I think they are a good solution for the intended purpose. I also think they may also have an added use for paddlers in self recovery in a capsize situation. If they are able to be mounted under the saddle, in the event of a capsize they could be moved to one side of the boat. Then when you flip it over, it will keep that hull from filling with water, which is the greatest challenge of solo self recovery in a capsize. Once flipped over they could then be re-positioned to the originally configured position to help with getting back in the kayak. At some point in the game, on a hot summer day and a nice swimming beach, I look forward to someone trying this out to see how it works. This reminds me of the way the ‘official’ motorized W kayak was developed, starting from Sungjin’s initial setup and video, and then lots of ideas and comments, thought-experiments and real-world ones, prototypes, and videos, of course. When folded, a slightly deflated float can fit inside a hull tip (E.G. behind the saddle bracket), and it can be secured there by attaching it with the rope-eyes. Such ‘internal flotation’ setup can serve as a solution for motorized W kayak anglers who feel they want more flotation just in case, but don’t like the idea of side flotation, even if they could detach the floats when they paddle, push-pole, or fish. The smart thing to do under such conditions would have been to let the waves carry the kayak back to shore, which was just a few dozens of yards away. I could have ‘picked up’ the boat there, in shallow water, reenter it just by hopping in, and be back in the game within seconds. But this video was shot ‘for demo purpose’. With the wider and much stable W500 the easiest way to do a deep water reentry is from the side. A couple of clients who tried this reported no problems. Deep water is the key. In Puget Sound you can be in 200′ of 54 degree water with currents that will not let you get to shore easily. So deep water re-entry practice is a necessity. Pulling yourself up on one end is the only practical way, and it is not “easy” even with just a swim suit on. If you had other clothing, yeeeha. As far as the water being a counter balance, not so much. It acts like a counter balance until you get about halfway on, upon which it stops acting as a counter balance and rolls the boat over. Two people changes the equation. So in water where it is important (aka life threatening) not to capsize, better to have a buddy in another Wavewalk, then it is not so difficult to get the boat righted, and very doable to get back in. Of course all of this is “extreme”. Practice in a nice warm lake and see what the boat behaves like. You will probably NEVER use it, but the information and skill you learn might determine the kind of decision you make as to where you put your efforts, and could very well save your life.